These are the goals of MED-DESIRE (MEDiterranean DEvelopment of Support Schemes for Solar Initiatives and Renewable Energies), a strategic project, co-founded by the European Union within the ENPI CBC Mediterranean Sea Basin Programme 2007-2013, aiming at fostering the energy efficiency and removing the cultural and technological barriers to the uptake of the distributed solar energy technologies within the Mediterranean Area. During the final conference “The sun for you: sustainable energy for the Mediterranean”, held in Rome on December 18th, the main project results have been presented by the partnership. Mediterranean region has a huge solar potential; nevertheless, many barriers against the development of such potential still persist: limited awareness of the solar technologies benefits, technicians and installers don’t always have the needed specialized skills, the quality of the solar components is often poor, there aren’t adequate financial incentives, there are no solar obligations for new or existing buildings. MED-DESIRE project realized 3 innovative tailored financial mechanisms for the diffusion of distributed solar energy technologies in Tunisia (for medium-size photovoltaic installations), Egypt (for Solar Water Heater in the domestic sector) and Lebanon (technology-neutral). Moreover, the project designed 3 solar ordinances (legal provisions compelling owners and/or constructors of buildings to install a solar thermal system, mainly for new buildings or for buildings undergoing major renovation), for pilot municipalities in Tunisia (Hammam-Sousse); Lebanon (Tyre); Egypt through the New Urban Communities Authority (NUCA). Improving the quality of distributed solar plants is very important. For this reason, MED-DESIRE supported the adoption of new technical standards and the empowerment of local certification and testing laboratories, through “capacity building” initiatives and feasibility studies and promoted the quality of solar installations, training professionals and installers and the qualification of technical trainers in vocational schools. In order to reach the previous objective, MED-DESIRE project realized: 10 pilot training courses - 4 on distributed solar technologies, addressed to vocational school trainers (in Egypt, Lebanon, Tunisia) and to energy technicians and professionals in Italy (Puglia); 3 on solar ordinances in Egypt, Tunisia and Lebanon and 3 on new financial mechanisms in Egypt, Tunisia and Lebanon; 5 capacity building initiatives - 2 study visits to 3 ENEA laboratories in Italy addressed to Tunisian, Egyptian and Lebanese groups of experts; 3 workshops “The quality supply chain of solar photovoltaic” in Egypt, Lebanon and Tunisia; 12 technical missions in the Mediterranean Partner Countries with local stakeholders. Within the project, 5 agreements at national and international level have been signed by partners and institutions, concerning the adoption of new curricula and standards and the uptake of market stimulus tools. Among these agreements, there is also the Memorandum of Understanding for cooperation in the Renewable Energy sector between the Andalusian Energy Agency (AAE, Spain) and the New and Renewable Energy Authority (NREA, Egypt), signed during the final event. The project has been characterized by a smooth cooperation among the partners, overcoming cultural and organizational differences, and a strong involvement of key stakeholders in MPCs: 100 local stakeholders (banks, local and national agencies, technical bodies, universities, training institutions); 200 companies, professionals and business organizations, 100 central and local administrations and institutions. More than 30,000 people involved in the project activities, the 8 public events (6 capitalization events in Spain, Italy, Lebanon, Tunisia and Egypt; a launching and a final event in Italy), the awareness raising successful formats to promote energy efficiency and solar energy (M’Illumino di Meno, high school labs, boy and girl Scouts EE camps, MED-DESIRE Award video contest, EE games for children, #TheSunForYou social media competition and PhotoBooth social media stand). 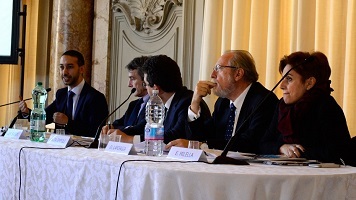 Besides showcasing the main results achieved during the lifetime of the MED-DESIRE project, the final event allowed top level representatives from national and international organizations to debate and share views on the perspectives of solar energy and energy efficiency in the Mediterranean countries. Some of the speakers participating in the MED-DESIRE final event were: Ahmed Badr, RCREE - Regional Center for Renewable Energy and Energy Efficiency Executive Director, Egypt; Khalid Chaouki, member of the Italian Parliament and President Cultural Commission Parliamentary Assembly, Union for Mediterranean/PA-UfM; Dario Chello, ENEA Responsible for Energy Efficiency Markets, Italy; Pierre El Khoury, LCEC - Lebanese Centre for Energy Conservation General Director, Lebanon; Mohamed El Sobky, NREA - New and Renewable Energy Authority Executive Chairman, Egypt; Vicente Fernandez, AAE - Andalusian Energy Agency President, Spain; Francesco La Camera, Italian Ministry of Environment, Land and Sea General Director, Italy; Domenico Laforgia, Director of the Department for Economic Development, Innovation, Education, Training and Employment – Puglia Region; Eva Milella, President of ARTI - Puglia Regional Agency for Technology and Innovation; David-Maria Sassoli, Vice-President of the European Parliament with responsibility on EU Neighbourhood Policy.